At 10mph a bike uses 20% more road space than a car... even when the car only carries its driver. And as the speed goes up, the bikes road use goes up faster than the cars! 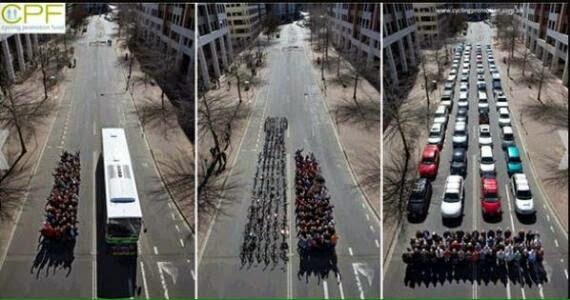 However this image has always annoyed me as it shows *parked* vehicles, not moving ones. If you are designing a car park, fine, but for road planning it it nonsensical. So the figures... (from first reliableish looking google search result in each case). A small car is about 5' wide and 13' long, at 10mph it needs 4' of breaking distance (thinking distance ignored again as same as for bike, so cancel out). So at 10mph a small car (regardless 1-4 occupants and luggage) uses 5' by 17' of road space. About 1.5m by 5m. So to travel safely a bike uses over 1.5sqM of road more than a car (whether the car is carrying 1 or 4 people!). In addition a car can reliably and consistently go at a particular speed - right up to the speed limit (or other safe speed) so meaning no passing is required. Whereas a bikes speed depends on the fitness/strength/recovery of the cyclist - so closing up/passing may be frequently needed - causing confusion, stress and conflict. And if a cars are travelling faster, then they are (of course) using the space they occupy for less time... So at 10mph a bike and solo driver may be on par, but in most other circumstance, the car uses less road space than a bike - a quarter with 4 passengers, and half for each additional 10mph of speed. So there you go - bikes need smaller parking areas, but use generally use more road space to get you there later and unfit to do anything once you arrive! **Edit** to put some linkable data in - the highway code breaking distances starts at 20mph, but going with that... And giving the bike figure the benefit of the doubt that it does include thinking distance. (Notwithstanding the fact cars have anti-lock breaks, are regularly MOT tested and are driven by trained/licensed drivers who are required to be alert/sober etc.Whereas a bike has what ever brakes it happens to have, in whatever condition they happen to be in and may be ridden by absolutely anyone). Another tweet war... a few more issues addressed. 1) Bikes can ride abreast. So the maximum is two, and not on busy roads. A car may of course carry up to 4 in the space it occupies. An experienced rider, on a well set up bike, doing emergency stops on a 'gentle slope' and his best results so reasonable to assume an average rider won't improve, and will probably do a lot worse(!). But is in the same region as the figure used (13' = 156") - stopping before hitting, rather than touching.